In order to promote safer and more efficient operating of a nuclear power plant, high sensitivity and high speed inspection technology have been required in in-service inspection (ISI). Especially, inspection of steam generators (SG) takes a long time because the number of the tubes is huge. Eddy Current Testing (ECT) which has an ability to scan at high speed and to detect defects with high sensitivity is used as an inspection method for heat exchanger tubes including SG. 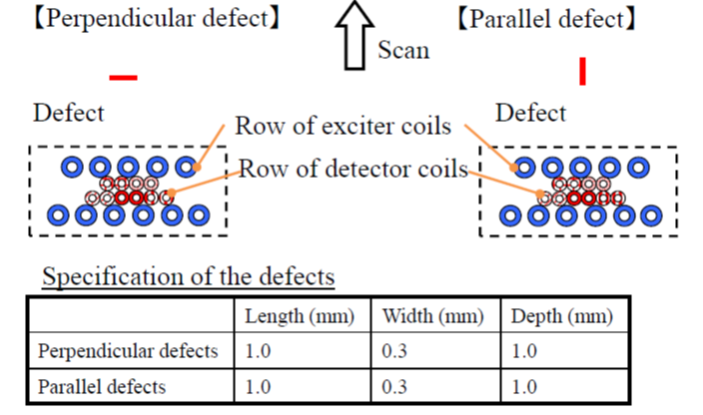 An ECT generates eddy currents by exciter coils on the surface of tubes and detects the variation of the eddy current distribution by detector coils with high sensitivity when an ECT probe moves over the defects. However, the performance of ECT is affected by reduced sensitivity due to some factors. A typical factor is the lift-off (the distance between the ECT sensor and the surface of specimen). Until now, a resonant circuit and signal processing have been applied as a countermeasure against lift-off , . Furthermore, the sensitivity of ECT drops if the eddy currents flow in parallel to the defect direction because the change in the distribution is small. Since stress corrosion cracking (SCC) has a potential to grow in all directions due to residual stress, the difference of sensitivity for some SCCs might be found. This study aims at developing a new ECT probe, whose detection sensitivity is independent of the defect direction. As a first step, we developed a technique that can detect both axial and circumferential defects at the same sensitivity from the view point of the direction of eddy currents. ECT detects the change of the distribution of currents due to defects. 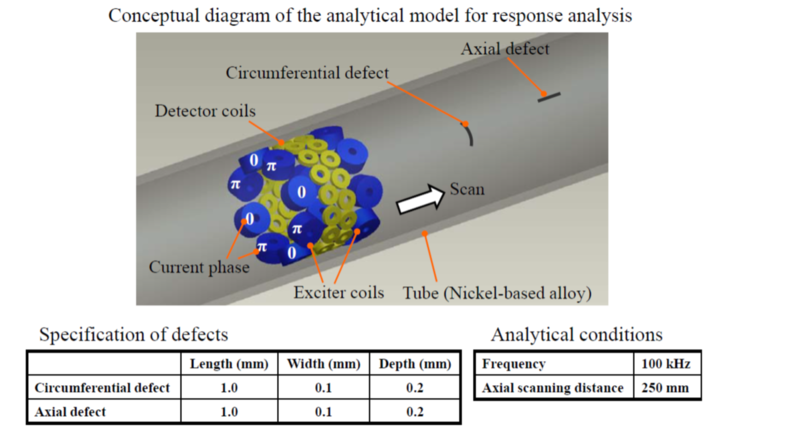 We proposed the way of forming currents angled 45 degrees to the tube axis as a method for equalizing the change of the current distribution due to both axial defects and circumferential defects as shown in Fig.1. Furthermore, we proposed also a way of switching the direction of currents axisymmetrically to maintain high sensitivity for the defects angled 45 degrees to the tube axis as shown in Fig.2. Fig.1 The relative location between the angled current and defects. New array coil structure was developed. This structure has two rows of exciting coils whose adjacent exciter coils in each row are alternately opposite to the phase of excitation current. This coil structure and exciting method lead to generating eddy currents which have opposite phase alternately in the surface of specimens. These eddy currents interfere with each other and generate strengthening area of currents in between adjacent exciter coils in each row and weakening area of currents in between tandem exciter coils which have same current phase are generated. Finally currents angled to the tube axis flow in between the two rows as shown in Fig.3. On the other hand, the sensitivity for Defect F shown in Fig.3 is low. The phase of only one row is inversed to switch the direction of angled currents axisymmetrically to the tube axis as shown in Fig.4. According to this method the sensitivity for Defect F keeps high. We call this exciting method “Inverse Exciting Method (IEM)” . The electromagnetic analysis was performed to confirm the efficiency of IEM. The analytical model and analytical conditions are shown in Fig.5. The distribution of the current density was calculated. According to Fig.6 which indicates the vector diagram, currents angled to the axial direction are formed between the two rows of exciter coils. Next, the analysis of ECT response was performed to confirm the detectability of the ECT applying IEM for axial and circumferential defects. The analytical model and analytical conditions are shown in Fig.7. We calculated the ratio between the maximum value of axial defect and that of circumferential one (RMA: Ratio of Maximum value of Amplitude) as an indicator for the dependence of the sensitivity against defects orientation. The closer RMA is 1.0, the better performance is. The example of the result of the response analysis is shown in Fig.8. From the results of the response analysis, we confirmed that the average of RMA (VA/VC) was 1.02 and the standard deviation was 0.006. Since RMA shows the value near one (1)、it is concluded analytically that IEM is effective and acceptable. Fig.6 The result of analysis for performance confirmation of Inverse Exciting Method. We prepared a new inner ECT probe applying IEM and conducted defect detection tests for both axial and circumferential defects. The overview of the ECT probe applying Invert Exciting Method (IEM-ECT probe), a circuit diagram of the exciting coils and detector coils are shown in Fig.9. 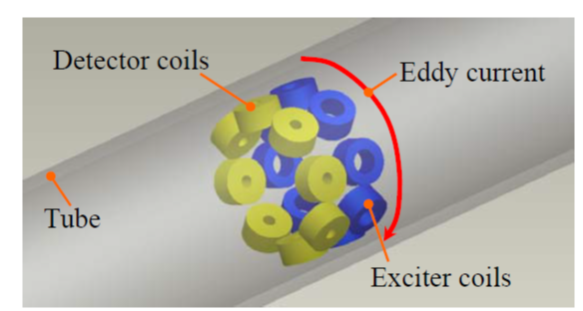 In order to supply the excitation current in the phase conditions equivalent to those in Fig.3 or Fig.4, in each of the two rows the exciter coils were connected in series but wound alternatively in the opposite direction. In addition, the ECT detector can inverse the current phases only in one of the coil rows by the circuit E. So it is possible to form angled currents and inverse the direction of the currents axisymmetrically. We conducted detection tests of defects, which were simulated on the outer surface of the tube by electrical discharge machining (EDM), using IEM-ECT probe. The conceptual diagram of the experimental setup and the specification of simulated defects (EDM slits) are shown in Fig.10. In this detection test we also conducted defect detection test using the comparative inner probe as shown in Fig.11. The comparative inner probe consists of two coil rows – one row for exciter and the other for detector. All exciting coils are connected in series and wound in the same direction. Therefore the comparative inner probe generates circumferential eddy currents. We calculated RMA for cases of IEM-ECT probe and the comparative inner probe and compared the results. The experimental result is shown in Fig.12. Each maximum value of amplitude used to calculate the RMA was sufficient to detect each defect. 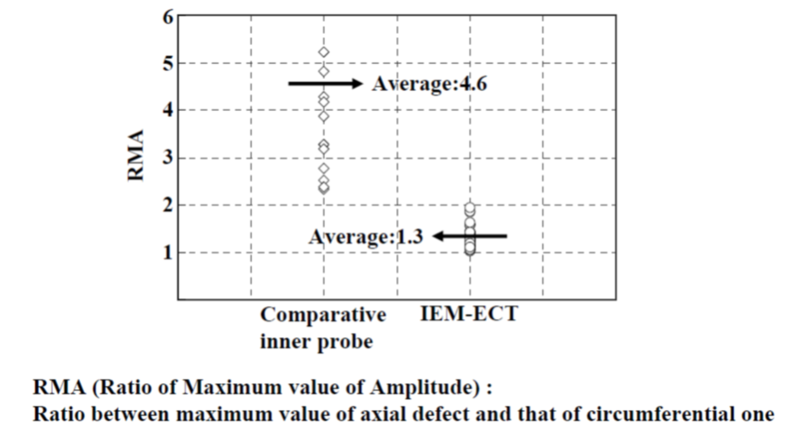 From the test results shown in Fig.12, we confirmed that the average of the amplitude ratio for axial and circumferential defects was improved from 4.6 to 1.3. In conclusion, Invert Exciting Method efficiently makes ECT for tube inspection more reliable against defects orientation. We prepared a new array ECT probe applying IEM for plate structure and conducted defect detection tests for two defects – one is parallel and the other is perpendicular to the scanning direction of the probe. 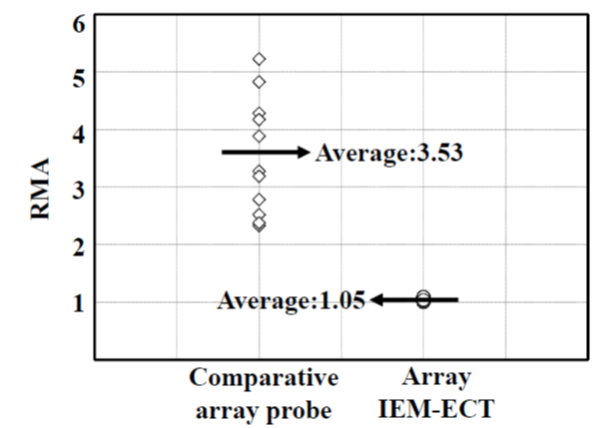 The overview of the array ECT probe applying Invert Exciting Method (Array IEM-ECT probe) is shown in Fig.13. 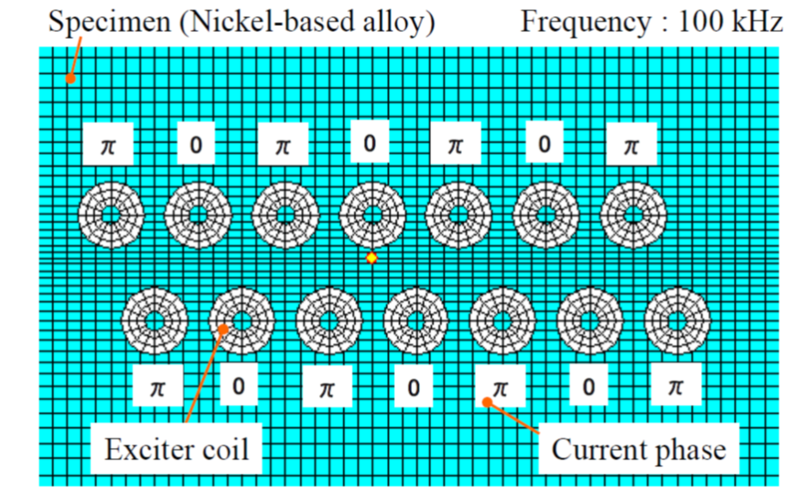 Connection methods in each row and winding direction in each coil are same in Fig.9. The conceptual diagram of the experimental setup and the specification of simulated defects (EDM slits) are shown in Fig.14. Test frequency is 100 kHz. 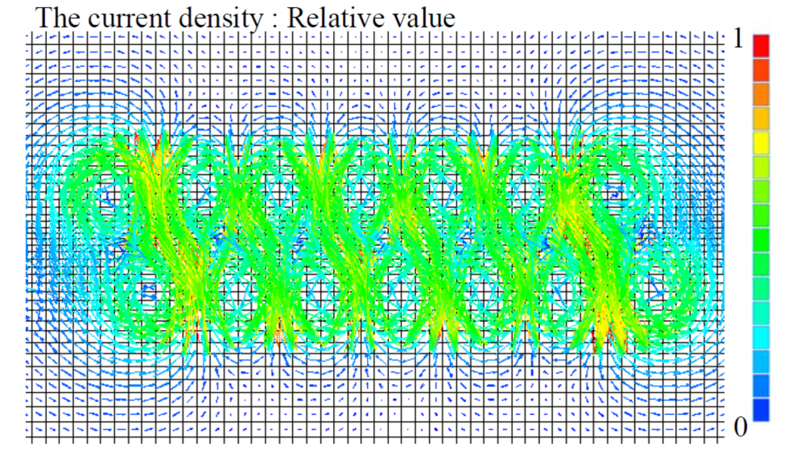 In this test, as a comparison, we used also an array probe – connection methods in each row are same in Fig.9 but winding direction is same in all coils. We calculated RMA which is ratio of the amplitude of parallel defect to perpendicular defect. The experimental result is shown in Fig.15. From the test results shown in Fig.15, we confirmed that the average of RMA was improved from 3.53 to 1.05. In conclusion, Invert Exciting Method also efficiently makes ECT for plane structure inspection more reliable against defects orientation. N. Kobayashi, et al., “Basic Characteristics of Eddy Current Testing using Resonant Coupling”, ASME 2012 Pressure Vessel & Piping Conference (PVP2012), Toronto, Ontario, Canada (2012), PVP2012-78429. 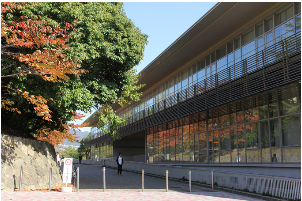 Y. Yamamoto, et al., “Development of Analysis Software for Intelligent ECT Probe”, 7th International Conference on NDE in Ration to Structure Integrity for Nuclear and Pressured Components, Yokohama (2009), Steam Generator Tube Inspection Ⅰ , pp.957-963. S. Ueno, et al., “Suppression of Reduced Sensitivity of Eddy Current Testing Depending on Defect Orientation” 9th Japan Society of Maintenology Annual Conference, Tokyo, (2012), pp.270-272.